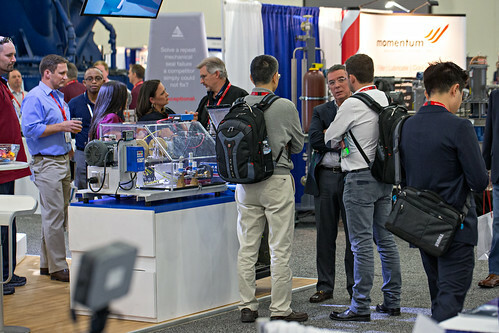 Exhibit floor conversation - By Texas A&M Turbomachinery Laboratory - Image courtesy of TPS 2017 - All Rights Reserved. AESSEAL Inc, will exhibit a wide range of its industry leading products at the Turbomachinery & Pump Symposia (TPS) in Houston, USA, in September. The TPS provides a global forum for pump and rotating equipment engineers and technicians, primarily from the turbomachinery, pump, oil & gas, petrochemical, power, aerospace, chemical and water industries. AESSEAL, the global designer and manufacturer of mechanical seals and support systems, whose US headquarters are in Rockford, Tennessee, will exhibit its API systems and gas seal solutions, API related products such as the CAPI, CFC and HPV range of single and dual mechanical seals, as well as standard AESSEAL products such as SMSS and DMSF mechanical seals, and LabTecta bearing protector seals. Now in its 46th year, the TPS exhibition will run from September 18th-20th at the George R. Brown Convention Center, alongside a technical program of courses, discussion groups and lectures. John DeStefano, Director Southwest USA, who will represent AESSEAL at the exhibition, said: “The TPS is a key event which gives industry leaders an opportunity to meet, share product information and exchange ideas.